Gents 18ct Rose Gold Cartier Ballon Bleu. Automatic movement. Case diameter 46mm. Water resistant to 30 meters. Silvered opaline guilloche dial with black Roman numeral hour markers. 18ct rose gold fluted crown set with a blue cabochon. Sapphire crystal glass. Blued sword-shaped hands. Brown croc strap with 18ct folding clasp. Box and papers dated December 2007. Our reference S20997. SKU: 3012186. 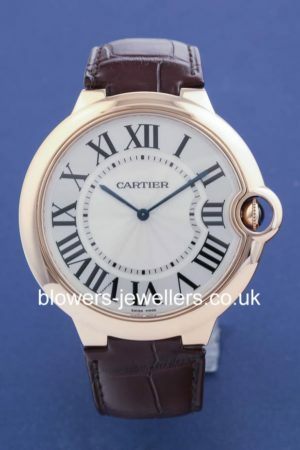 Categories: Ballon Bleu, Cartier.